675 ADSTD Andritz Fibreflow 350 Drum Pulper, 3.5 Meter Diameter Drum. Description: 675 ADSTD Andritz Fibreflow 350 Drum Pulper, 3.5 Meter Diameter Drum. 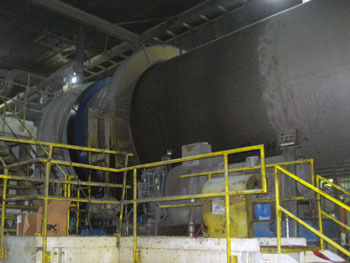 Pulper drum construction is 316 SS, 81' Length x 11.5' Diameter. Complete pulper includes drive and lubrication system. It has a counter clockwise rotation looking at the discharge end. Installed new in 2001 it was only in use for about 4-5 Years. Previously was pulping ONP / OMG / Pre-consumer Waste. Capacity up to 675 ADTPD Input / 500 BDSTD Output, depending on wastepaper grades. Equipment has been dismantled and professionally packaged. It is immediately available for shipment.